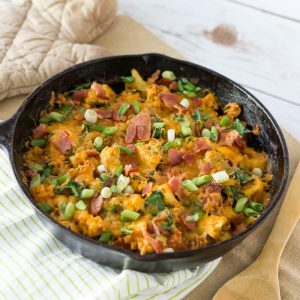 We love this Mexican chorizo breakfast skillet that is both low carb and keto friendly. In fact, it's so good and filling that we actually eat it for dinner twice a month! You can add as many or as little vegetables to the dish to customize to your family's tastes, and event throw in some potatoes if you aren't looking for a low carb breakfast skillet option. In a large oven safe skillet, melt butter. Add in onion, green pepper, mushrooms and cauliflower. Saute until vegetables start to soften about 5 minutes. Add in chorizo and cook for about 7 minutes. Chorizo will somewhat liquify but that is normal! Stir in spinach and 1/2 cup shredded cheese and mix until spinach starts to wilt. Top with the remaining cheese and stick pan in the oven. Broil on high for about 3 minutes until the cheese is bubbly and golden. Optional: Top with crumbled bacon and green onion.